When you make it to Hyde Park on Saturday afternoon, you could well be holding a bit of history in your hands. A project of the Museum of London and Goldsmiths University is looking to preserve a record of popular protest, and are looking to find a new home for your placards, banners, props and flags. “Britain has a rich heritage of protests, from the Suffragettes, to the Poll Tax demonstrations, to the Iraq War protests. But how these movements are remembered has largely been decided after the event, and not by those involved with the protests. We want to challenge that. The Goldsmiths team will be accepting donations at the demonstration on Saturday 26th March, and later on at the Museum of London on Saturday 2nd April. If you are going on the march and think your placard deserves its place in history, look out for the team’s ‘mobile exhibition’ of past protests. More details on the project can be found at the Save Our Placards page on Facebook. Cool idea, pity the Museum of Museum suppressed members of the Prospect Union from collecting signatures for a petition against cuts to conservators and curators, outside their doors on the same day as collecting protest signs with Goldsmiths. This was done with a threat of legal action against the union and promises of suspension/dismissal for members of staff attending in their own time. Come on Museum of London think this one through, at the same time as documenting the potest you are surpressing organised labour. Ironic really, when the Museum of London is in the process of making several of its senior curators and conservation staff redundant to save money because of the cutbacks. 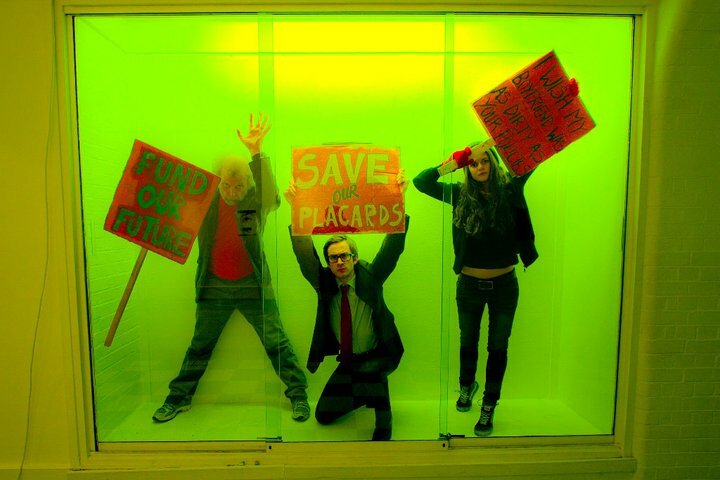 Perhaps the Goldsmiths team should be organising a Save our Museum campaign. yeah what is going on behind closed doors is a cinical stitching up of certain individuals by unscrupulous mamnagers, lots of people are being thrown on the scraphead and often its the less talented doing the chucking.So the dumbing down of our country continues,is the desire to keep the posters an attempt to see the real value of the demonstration not as a tool to fight capitalism but as an example of how fair and democratic the UK is and not like those other nasty countries around the world, like Libya who need our protection. The March for the Alternative saw up to half a million gather in London on Sat 26 March to protest the government's plans for fast, deep public spending cuts.